$2.79 to $184.99 & FREE Shipping on orders over $59 $35. 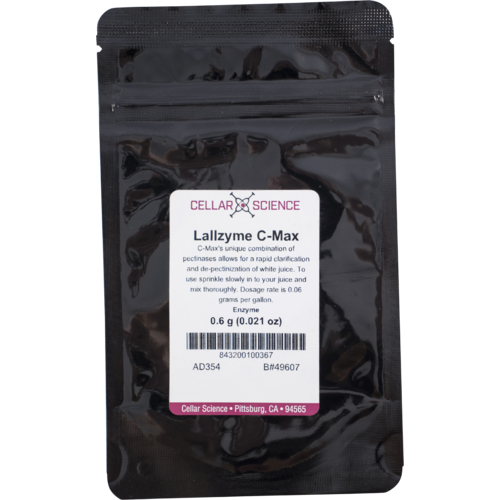 Lallzyme C Max is a specially formulated enzyme preparation for the rapid clarification and de-pectinization of white juice. Typical results see clearing in 4 to 6 hours. C Max's unique combination of pectinases allows for a quick reduction in the viscosity of the juice and promotes fast sedimentation and clarification. Ideal for use in applications featuring low pH, temps below 20C, short reaction times, high pectin content resulting from aggressive pressing or longer macerations - in other words, perfect for small wineries and home winemakers! I want to make sure of the dosage rate for C-Max enzyme - 0.06 g/Gal isn't much after I weigh it out. Are we sure it isn't 0.60g/gal? BEST ANSWER: Hi Greg - .06 is the correct dosage. Fluffy lees in white muscadine wine can result in the loss of significant wine. I used this product at 3x the recommendation and it worked like a charm. This is the first time I have tried this product. It works exactly as described. I pressed out my Brianna grapes, added the enzyme to the juice and let it set overnight. In the morning I could clearly see the bottom of the bucket--much different than other years. I assume this will improve the flavor and clarity of the finished wine.